Wow, how about this for some unfortunate and unforeseen events. Lane Kiffin, the previous head coach at Tennessee, left Tennessee to head to the big lights and big money at USC in sunny southern California. His departure from Tennessee was not very welcomed by the UT community, alumni, boosters, and football players – in fact, he became both a target and a laughing stock of the entire SEC. Well, Lane Kiffin had just recently got his dream job – head coach of one of the biggest and brightest football programs in all of college football, if not the biggest. 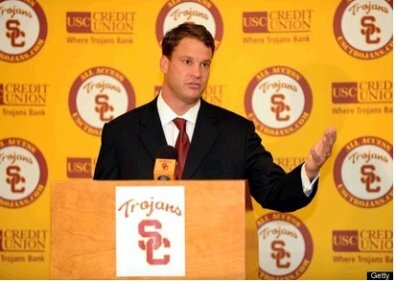 No sooner does Lane Kiffin show up to start his dream job, coaching the dream team of college football, right in the middle of dreamy Los Angeles, does the USC athletic department (including the football program) get hit with what I believe is the hardest NCAA penalties in the history of college football. And the one penalty that hits Lane Kiffin right where it hurts the most? A 2 year ban from all post season bowl games…. OUCH! ♦ Public reprimand and censure. ♦ Four years of probation: from June 10, 2010, through June 9, 2014. ♦ Postseason ban for the 2010 and 2011 football seasons. ♦ One-year show-cause penalty for assistant football coach Todd McNair (June 10, 2010, to June 9, 2011). ♦ Vacation of all football wins, including football bowl games, from the 2004 and 2005 seasons. ♦ Reduction of football scholarships by 10 for the next three academic years. ♦ Remittance of the $206,200 the university received for its participation in the 2008 NCAA basketball tournament. (self-imposed). ♦ Disassociation of football player Reggie Bush, basketball player O.J. Mayo and “booster” Rodney Guillory. ♦ Release of three men’s basketball recruits from their letters of intent. (self-imposed). ♦ Prohibition of all non-university personnel, including boosters, from traveling on football and men’s basketball charters; attending football and men’s basketball team practices; attending or participating in any way with university football and men’s basketball camps, including donation of funds; and having access to the sidelines and locker rooms for football and men’s basketball games.